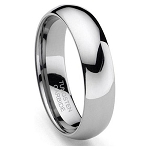 Sophisticated wedding band or excellent every day accessory. 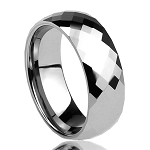 This band has over 288 polished facets for a fantastic shimmer that is guaranteed to turn heads. or cause irritation to your skin. If you need a durable yet elegant ring, this is for you! Included 100% Money Back Guarantee, comes with a black velvet stylish ring box. Q: is it solid tungsten? Q: DOES THIS RING COME IS A WIDER SIZE THAN 6MM ? A: This now comes in a 8mm matching band. If you scroll down, you will see it below! Hope this helps! 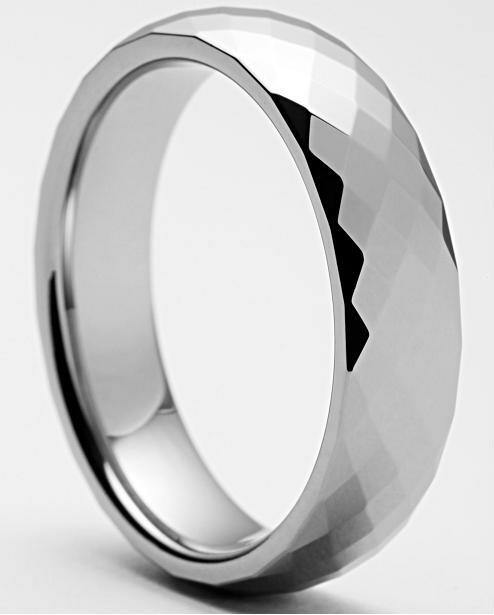 Q: Do this ring have Tungsten engraved on the inside? If so what ring do you have that does not have this engraved on the inside? Q: How exactly does Mercury factor into this ring? Q: Hello, Can you tell me how wide this ring is in inches? I couldn't find details other than 6mm. This ring is gorgeous! You won't be sorry to purchase it. Much prettier than the photo. This is the second ring I have bought since I lost the first one. I love the ring and I get lots of compliments on it. It's great quality and finish. You will be pleased if you order this ring. Great quality and fit was perfect. I have read a lot of the reviews and they have said it all. From Quality, Price, Guarantee, and exchange policy. They are simply the best. Like the ring very much. Nothing but phrase for the company and the person I talk to very nice and very helpful. I love this ring! The fit is great and the delivery quick and the price is awesome. Thanks so much. Awesome quality of materials and finishing. Will but again! A very nice ring....the way the angles are cut it reflects the light like sparkling diamonds. Got Gold and silver, to change for different look, couldn't be happier with purchase of both, Great delivery and great ring's wife got gold ring and love's it, will buy more without worry of dealing with this great company. I purchased 13 Tungsten Rings. They are of very high quality and I am very happy with them. If you like simple yet elegant looking rings, these are for you. I am now wearing this ring. All the rings are very finely crafted. The ring is beautiful, makes a great wedding band. Thanks so much for the great service and fast shipping. When I ordered a ring for this price I was expecting something that you would get for $39. bucks. Was very impressed and wondered why all the jewelry stores can get away with charging $300. to $700. I have only wore this ring for a short time so I can't tell how it will hold up but for the price I paid I can always get another one. Very impressed the way it sparkles like it has stones embedded in the ring. I love this ring! It has a ton of sparkle; the picture doesn't do it justice. Very comfortable. Don't hesitate to buy this ring! You won't be disappointed.